The Monastery of Spiliotissa in Aristi is located on the left bank of the river Voidomatis, onto a steep cliff on the way to Papigo. It was built in 1665, had great wealth and at the social work, until the 19th century, was included the operation of schools in the region. The Monastery of Agia Paraskevi in Monodendri, the oldest surviving church in Zagori, at the brink of the gorge of Vikos. It was built in 1412. The monastery of Rogovo in Tsepelovo, was built in its present form in 1749. The monastery had great wealth and remarkable library and was intended by the eminent residents of Zagori to be used as University before 1820. Agios Georgios in Negades, built in 1779. The interior is decorated by great frescoes of painters from Kapesovo. Agios Nikolaos in Konitsa, dated from 1842. It has rococo frescoes, important carved wood temple and portable icons. The Monastery of Stomio, is situated in a spectacular location into the gorge of Aoos. It was founded in 1442 and moved in its present location in 1774 by Abbot Constantine. Its temple with several Byzantine icons is very interesting. The Monastery of Molyvdoskepasti is located near the village Molyvdoskepasto at the confluence of the river Aoos and Sarantaporos. The monastery, according to tradition, was founded by Emperor Constantine Pogonatos, while he was turning back from his expedition to Sicily (671-672 AD), and later was restored by the Emperor Andronicus Palaeologus (1328-1341m.Ch). It took its name from the leaden splates that covered the church at the past. In catholic of the monastery important frescoes of the 13th - 18th century are rescued. Today it is an active monastery for men. The Monastery of Zerma, according to tradition, was built by Emperor Constantine Pogonatos and acquired its present form in 1656. This is one of the oldest monasteries of Epirus. Its catholic, three-aisled basilica with three domes, is unique in Epirus and has unique architecture and unique frescoes. 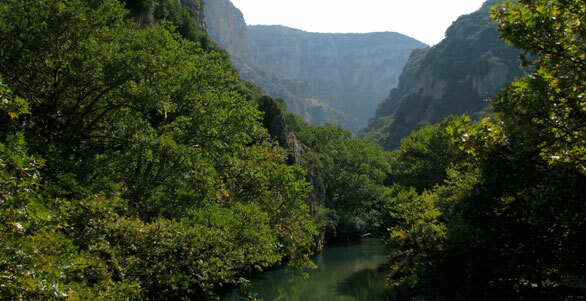 Hotel Faraggi is located in an ideal point, between Konitsa and Zagori, near the vilaage Kleidonia, and specifically, at the 51st km Ioanninwn- Konitsas, next to the old stone bridge of Kleidonia and Voidomatis River, which is the cleanest river of Europe. It is 6 km far from Zagorohoria , 10 km from Konitsa and about half an hour from Ioannina. It is an ideal place for exploring the area all year round in a quiet, friendly and hospitable environment.